When was the first time you saw graffiti? Maybe you were on a drive with your parents and saw a tag on a concrete column in an underpass. Maybe you were on a subway or a bus and saw drippy indecipherable letters on the seat in front of you. Graffiti is an artform stretching across the globe and deep into history, but its true origins can be hard to pin down. Some argue the first graffiti was created around 15,000 BCE, on the inside walls of caves in Lascaux, France. Primitive artists used flowers and other plants with dyed mud to paint. Others argue that graffiti is more modern and that urban graffiti as we know it began around 100 BCE in the Roman Empire with etchings and scratches on walls of the city’s structures. Some say graffiti as we know it today was invented much later — during the 1960s in Philadelphia, when a man nicknamed Cornbread wrote his name on the walls at the middle school he was attending and then later on the whole city. Regardless of the origins, we all have our own first experiences with the artform. The first tag I ever saw was on the highway going to my grandparent’s house. In cobalt blue, the tag read “SPOK.” I later learned that this was probably a reference to Spock from Star Trek, which I found confusing: Why didn’t they write their own name instead? Who was this person? What message should I have interpreted from this strange message? The American graffiti landscape, like any cultural phenomenon, is wildly varied. Depending on where you first saw graffiti, your feelings toward it can be as diverse as the art form itself. Dora from Catskill, NY said there were “graffiti clans” that would tag the name of their clan and the members’ names in spray-paint. Her first instance of seeing street art was in New York City when she was about 14. She said she saw all kinds of graffiti and murals which was a radical departure from the gang-related vandalism she saw at home. Many argue the American graffiti scene began with gangs primarily, who would use tags to mark territory and attack rival gangs verbally. In Catskill, she said the street artists were mostly young people engaging in rebellious behavior. Little did these young rebels know they were taking part in one of the precursors to modern graffiti as we know it. While gang-related graffiti has faded from the public eye, it still stands out as an artifact of a different era for graffiti in America. Emily, from Milwaukee, Wisconsin, said that her city was populated by murals and that illegal graffiti had no real presence in public places. One instance that stood out to her was a large painting of Dr. Zoidberg from the animated show Futurama that was on the side of the highway. She also said that a lot of trains pass through Milwaukee and these trains carry graffiti with them as they travel from coast to coast. She said this is probably where her first graffiti experience was and where the majority of illegal graffiti can be found in Milwaukee, although it isn’t done by local vandals. Modern train graffiti is a remnant of the near dead art form called “hobo writing,” which was popular in the late 19th and early 20th century when migrant workers were riding freight trains across the country looking for agricultural and industrial employment. They would mark trains with industrial crayons (now known as streakers) and with other implements. The markings they left behind had their names, the direction they were headed and whether or not they found employment in a particular place. Other symbols indicated things like halfway houses and bars. Modern graffiti on trains is now less practical and more aesthetically oriented in its purpose. The last interview I did was with a young woman named Scout, from the island of Manhattan, and she had little to say on the subject. She said she was raised in a graffiti-saturated area and hence paid it no mind. She suggested that it was just a part of living in New York City and you had to get used to it. She didn’t say if she could pin down a first true graffiti experience because she had been raised around it her whole life. Graffiti often becomes a part of the landscape it occupies and has real cultural value that cannot be replaced. Graffiti has come to symbolize gentrification, the urban sprawl, crime, gang violence, and rebellion. Our first experience with graffiti shapes the way we see it for the rest of our lives, and consequently how we see issues like gang violence, gentrification and urban sprawl playing out in our cities. 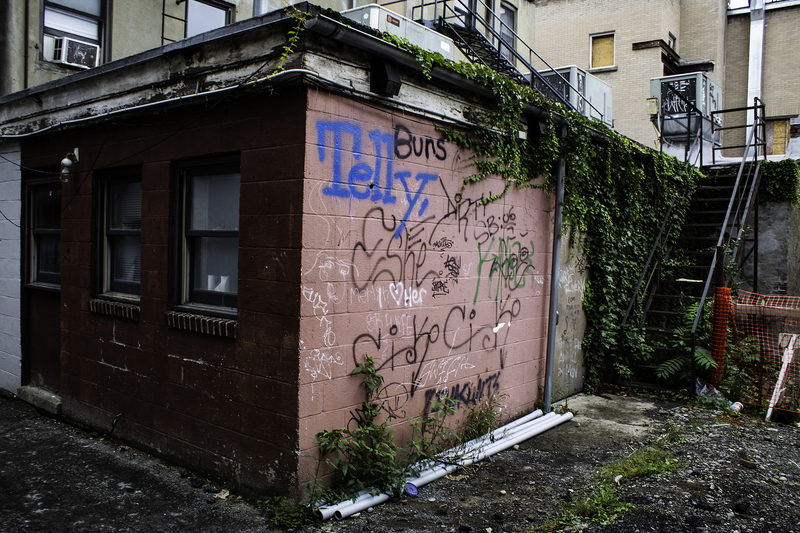 Leo Baumbach is a first-year English major and he’s the real Banksy. You can email them at lbaumbach@ithaca.edu.